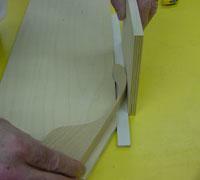 Feather boards are used to keep constant pressure on material (ie hold it in place) while cutting on a table mounted router. They can be used horizontally to keep the material tight to the fence and also vertically to keep it tight to the base plate. Use straight grained wood such as oak or ash. 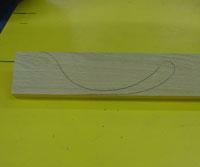 The thickness at the narrow part will determine the �spring� or strength of the feather board. 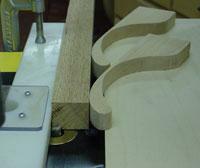 Trace a pattern on straight grained wood and cut on the band saw. Use a spacer to make sure they are both mounted in the same location. This will ensure equal pressure from both feather boards. Mount to a backer board. 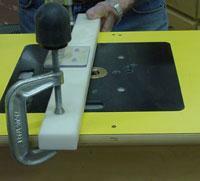 Clamp the table fence into place on the router table. 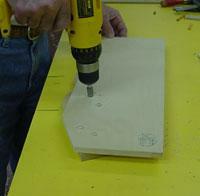 Clamp the feather board fixture to the router table so the pressure against your material is near the router bit. 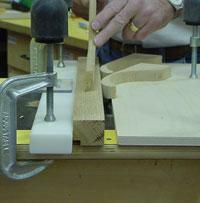 We suggest you use a push stick to apply downward pressure on your stock when making the cut.